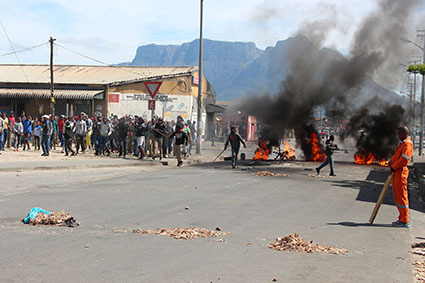 A young woman and an elderly man were shot during the violent housing protests in Langa yesterday, and traffic chaos continues as central line trains cancelled. A 20-year-old first-year Cape Peninsula University of Technology (CPUT) student was shot in the neck, and police state a 79-year-old man was injured in “a shooting incident” during the protests which saw Metrorail equipment destroyed, a post office building burnt, businesses looted, roads blockaded and the N2 shut down for several hours as police used rubber bullets and tear gas in running battles with protestors. The student’s aunt, Nolizwe Ndikandika, said her niece – whose name is being withheld – was shot in the neck by someone firing from the rooftop of a Chinese shop next to Shoprite and was admitted to Groote Schuur hospital where she was still being treated today. The hospital confirmed that a 20-year-old woman was admitted for a gunshot wound but would not release any further information. She said they would open a case with the police as soon as her niece was released from hospital. Police did not confirm the woman was shot, but spokesperson Frederick van Wyk said they were investigating circumstances surrounding the shooting in Washington Street, Langa, in which a 79-year-old man was injured. Van Wyk said an attempted murder case had been opened. Langa task team member Xolani Bhili said two residents were also “scratched” by bullets he believed were fired by police. Bhili said the residents were in their homes when they each narrowly escaped serious injury. Additionally, a 17-month-old child suffered from tear gas inhalation. The child’s mother, Nokhanyiso Nzinya, said she treated her child by washing his face with water and giving him milk to drink. The continued cancellation of Metrorail trains on the central line due to destruction related to yesterday’s protests resulted in snaking queues of frustrated commuters lined up at township taxi ranks this morning. Metrorail announced the cancellation of their central line, which connects Langa, Gugulethu, Nyanga, Philippi and Khayelitsha, as well as Bellville to Cape Town, due to destruction of equipment and concerns over continued volatility in the area. As a result, minibus taxis were overloaded with people trying to get to work, with extraordinarly long queues of people waiting at taxi ranks throughout the city. Dube said she was concerned she would receive a warning from her employer for being late. Khayelitsha taxi owner Soso Ngqoleka said the failure of the trains made their lives more difficult as well as they were placed under pressure. “As the taxi operators we condemn this kind of situation, we believe that all modes of transport should operate efficiently because this situation is putting us under pressure because it is causing traffic congestion and road accidents are bound to happen,” said Ngqoleka. Metrorail stated eight apparatus cases, two track boxes and numerous signals were damaged during yesterday’s protest. Metrorail central line manager Cyril Baurer said it would several days to replace and repair the equipment and reinstate the service. Reported by: Zimbini Molisi, Chandre Appels, Ezra Makhetha and Dalton Ndongeni. CORRECTION: This story was initially published with the first line stating “Two woman and and elderly man were shot…” This was a sub-editing error and has since been corrected.